Working on a floor plan, and just getting started on the windows. You zoom right in so the first window is nice and gigantic on your screen. You draw in jambs and sashes, rebates and drip lines, double glazing and spacers, caulking and flashing. You sit back in your chair, a satisfied smile on your face. Your window jamb is razor sharp and perfect, a 1:1 facsimile of real life. But then you press print, and the floor plan is committed to paper at 1:100 scale. Your elegantly assembled jamb has been reduced to a black blob of ink, illegible. An exceptional documentation set includes enough detail to show everything that needs showing, but no more. This ensures every drawing works as hard as possible, keeps a drawing set lean, and prevents time from being wasted on linework that looks wonderful on screen but is invisible when printed. So determine the scale of drawings early in the documentation process, and tailor their content to their sizes. A window might be two simple rectangles and a line at 1:100, have sashes and rebates drawn in it at 1:20, and double glazing, caulking and flashing added at 1:5. 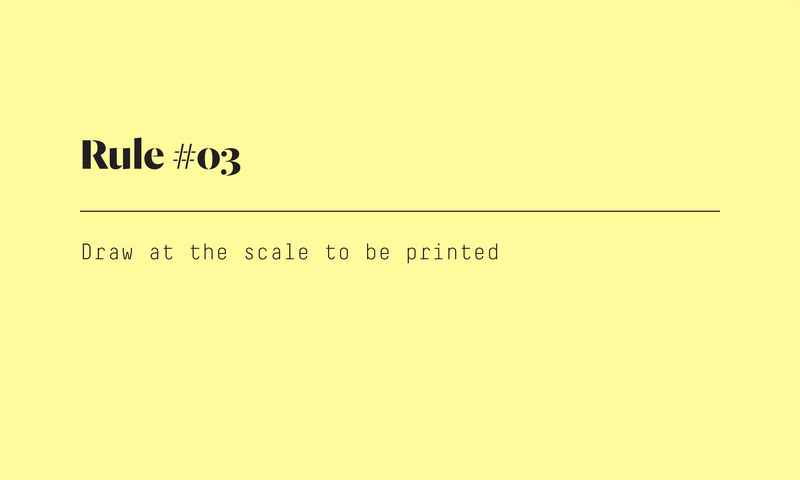 Commit to regular printed reviews at scale and page size so assessments about what drawings should and shouldn’t show are done at the scale the builder will see them. Draw at the scale to be printed, author’s own image.